19-year-old Becca is wearing combat boots and a prom dress for the prom she refused to go to. I imbed her portrait into the faded splendor of John and Mable Ringling’s 1920’s ballroom, a rugged real woman who sits in tension with the fanciness she is supposed to want but doesn’t. 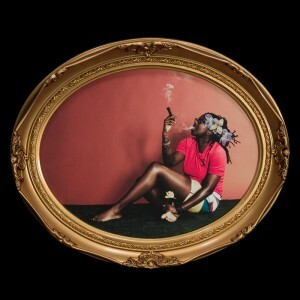 Tiona sits in her proverbial neighborhood, on a park bench, smoking a cigar with orchids in her hair. Whether imagined or real, my portraits challenge the boundaries of what gender should be, and reveal magical playful genders people are actually living. When I place portraits into new and imaginary settings, the fantasy is heightened and beauty exalted. In my world, gendered relationships do not pose as opposites but as fluid and paradoxical often whimsical and naive or in your face and courageous. I want beauty, not animosity, to exist in this part of self so I put the photographs into decorative settings and rooms of wonder, in places both otherworldly and real. I began to incorporate photography into my artwork in 2007 when I started the Gender Portraiture Project. The project first began as an exploration of female identity and as an extension of my own self-portrait and has since opened to a more inclusive interpretation of gender. My process begins through invitation. I invite people to participate as both subject and collaborator. During our first meeting we share personal stories about our gendered self and begin to form an intimate connection. The final portrait scenario manifests itself through this initial dialogue where the subject has the opportunity to direct the aesthetics with equal input. 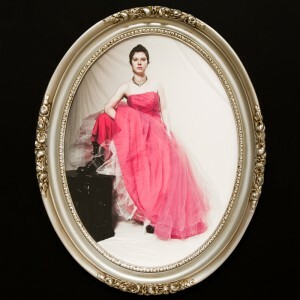 Each portrait is a visual interpretation of a fantastical and inner (often hidden) personality; the narrative is then extended into an interpretive setting beginning with the framed photograph and into a larger installation. As part of the process, from interview to visualization, each person has the opportunity to explore potentially culpable characteristics in a safe non-judgmental space and then be displayed as attractive within a glamorous context. This process often serves my work in the realm of art and change and has resulted as a means of catharsis for many of my participants. Since my fellowship at Center for Emerging Visual Artists, two years ago, I have become aware of the limitations my work offers. Audiences either love my work or don’t get it at all. As a result, I have begun to open up the dialogue to offer more playfulness and to experiment with material process creating installations that give the illusion of elaborate home settings. This in turn has lead me to play with two & three dimensional illusion using photographic images, both acquired and taken by me. I digitally alter photographs using Photoshop filters to resemble mural sized black and white etchings, often inserting a portrait into the scene. I then set framed portraits and furniture into the final installation. I have found when I photograph these vignettes for my portfolio, the eye is often fooled into thinking the murals were three dimensional at the time the photo was taken. My newest work has become human scale vignettes and full-room installations in galleries, stage sets, and a room of a house.